Step back into a time of avocado green, angel dust, and fun fonts in government documents. 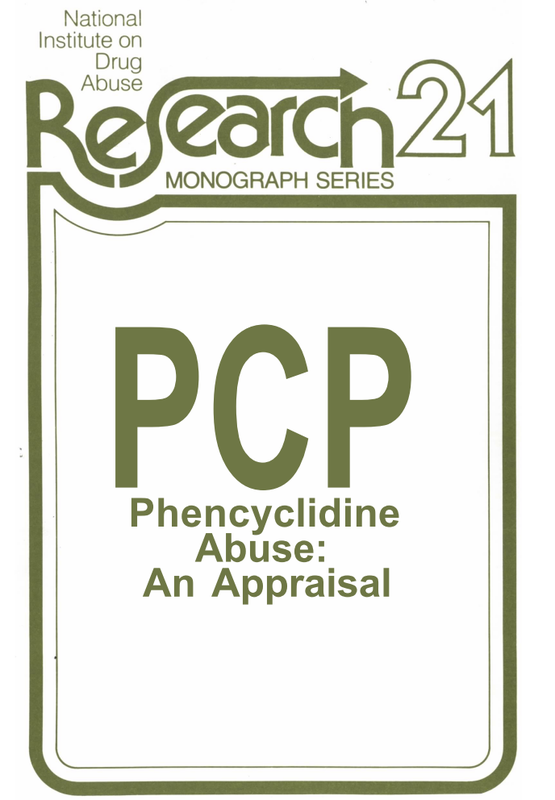 Phencyclidine (PCP), or “angel dust” as it is more commonly known to drug users, posed until recently a relatively modest problem. While some illicit use occurred as early as the mid ‘6Os, the drug’s initially poor street reputation seemed to make it decidedly unlikely that it would ever become popular as a drug of choice. More recent events have made it abundantly clear that our initial optimism was poorly founded. A change in mode of use from oral ingestion to smoking or snorting, which may enable the user to better control aversive consequences of use, together with the ease with which PCP can be synthesized, have markedly changed the phencyclidine abuse picture. In one year (from 1976 to 1977) the number who had used phencyclidine as measured by NIDA’s National Drug Use Surveys nearly doubled in the 12 to 17 year age group. Among young adults between 18 and 25, the number of PCP users increased nearly fifty percent in that same year. Although the level of use detected was still modest, there is good reason to believe that the standardized indicators of the extent of PCP use and of its adverse consequences represent significant under-estimates of the seriousness of the problem. Clinical reports have also indicated that phencyclidine use can precipitate violent acting out and seriously self-destructive behavior as well as psychotic thinking and behavior. The full document is available here as a 337 page PDF. The extent of use of PCP appears to be falling. 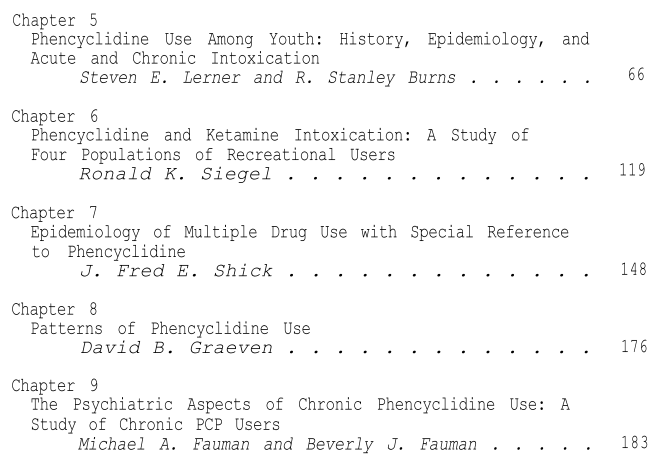 In 1979, 13 percent of high school students said they had tried PCP. By 1990, that figure had fallen to 3 percent. Results of a National Survey on Drug Use and Health, published by Substance Abuse and Mental Health Services Administration (SAMHSA), show that, in 2015, 0.2 percent of 12- to 17- year olds had tried it at some time in their life. Oglesby EW, Faber SJ, Faber SJ. (1979). 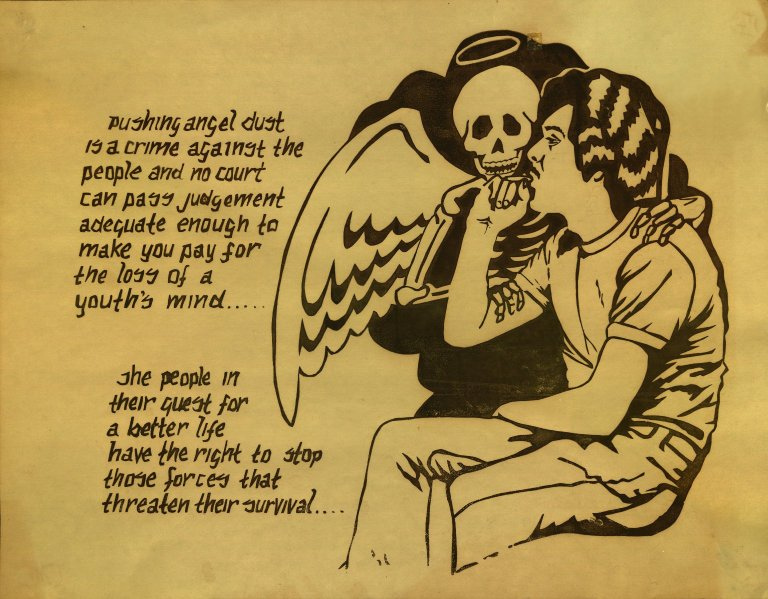 Angel Dust: What Everyone Should Know About PCP. Lega-Books. Clinical reports have also indicated that phencyclidine use can precipitate violent acting out and seriously self-destructive behavior as well as psychotic thinking and behavior. Chronic phencyclidine use has culminated in a picture of violent and aggressive behavior, paranoia, delusional thinking, and auditory hallucinations. In most cases no known behavioral disturbance or psychiatric problems preceded the use of phencyclidine. But even though angel dust can cause a variety of psychotic symptoms including hallucinations, delusions, disorientation and a feeling of paranoia, a normally nonviolent person is not going to suddenly become a vicious, marauding maniac simply because he has consumed this substance. 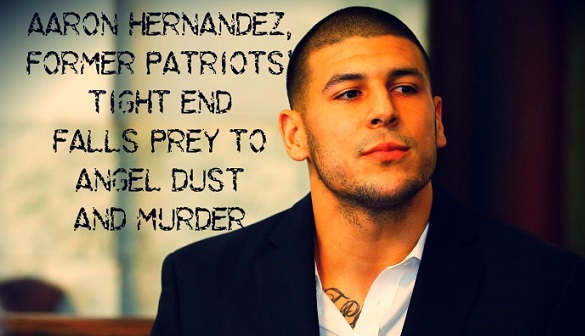 Nor is he going to gain extra strength while under its chemical spell: most people arrested for drug crimes go quietly or with minimal fuss when they are taken into custody, so when a person high on angel dust goes on the attack, it can catch everyone off guard. Macabre circus or important case study or hyperbole or all of the above? What made the brain extraordinary, for the purpose of science, was not just the extent of the damage, but its singular cause. Most brains with that kind of damage have sustained a lifetime of other problems, too, from strokes to other diseases, like Alzheimer’s. Their samples are muddled, and not everything found can be connected to one particular disease. In my main blog, I’ve been struggling to write a post that highlights the misleading nature of this claim. How much of that was Branch’s own hyperbole? Or was he merely paraphrasing the famous neuropathologists who presented their results to the media, not to peer reviewers? Is it my job to find autopsied brains from PCP abusers and suicides by hanging? Searching for the latter, by the way, will turn up some very unsavory material in forensic journals and elsewhere. At any rate, I think much of this literature glosses over any complicating elements, and neglects to mention all of the cognitively intact former football players whose brains haven’t been autopsied. This entry was tagged addiction. Bookmark the permalink.